If you like your dress shirts featuring loud colors and made of bold patterns and plaid, try Fratello brand dress shirts. 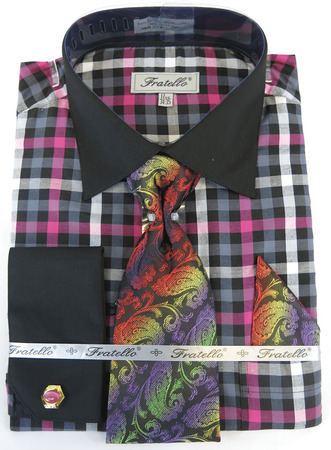 Fratello makes all of their colorful dress shirts for men who don't want to be anonymous. This loud plaid dress shirt has both black and fuchsia combined with black french cuffs and collar in a style that is not easy to ignore. Made of cotton/poly blend.